Never put your pet’s name in the ad – that will give an unscrupulous person control over your pet. It’s also recommended that you not put your pet’s name on his or her ID tag for the same reason. Put only a partial description of your pet in the ad, so you can have callers describe your pet to you over the phone. A scam artist will not be able to describe your pet to you. Forsyth County law requires the reporting of found dogs and cats. The Animal Services website Lost & Found section is the official Lost & Found site identified in FCC 6-19 Found domestic animals – Reporting and/or registration. 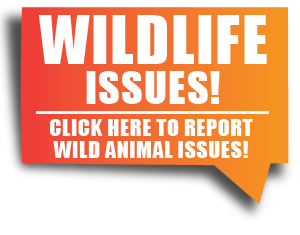 If you do not have web access, please contact Animal Services at 336-703-2480 and staff will see that your report is filed. For your safety, don’t put your home address in the ad. Just list your street or the vicinity in which your pet was lost. Thoroughly search your property and neighborhood on foot calling your pet's name. Check under porches, in and under vehicles, in sheds and garages, drainage pipes and any other possible hiding places. Go door to door. Take a picture of your pet with you. 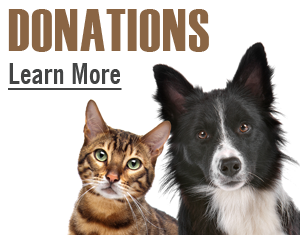 Enlist help from animal lovers you meet. Be sure you have a clear photo and a detailed description of your pet. Offer a reward! Don't forget to put your phone number on the posters, but not your address. Hand out the posters to neighbors. Leave them on the doors of the people who aren't home. Go to ALL local shelters. 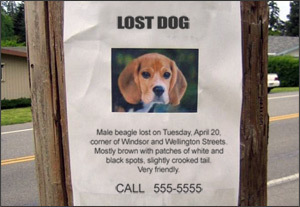 Most agencies do not have the manpower to post lost/found listings quickly. Visit the shelters, take a picture of your pet and provide them with an accurate description. Check back at least every other day. Place an ad in the lost and found section of your newspaper. Check the lost and found ads daily. Local Newspaper Information - If someone responds to your ad, use caution! Do not have the caller come to your home. 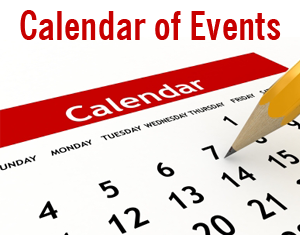 Suggest meeting in front of your local law enforcement agency. Do not meet the caller alone. Leave items with a familiar scent outside your home. These items can attract your pet that may have become disoriented. Don't give up! Animals that have been lost for months have been reunited with their owners. Don't assume the animal has been abandoned. It's very possible that the animal on your doorstep has a family who loves him and is searching for him. If an animal is wandering the streets take him to safety. Do not put yourself in danger...be cautious...act quickly. It just takes seconds for a cat or dog to be hit by a car. Look for Identification. A name tag can lead you directly to the owner. Rabies tags and tax tags have traceable numbers. 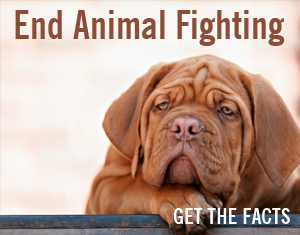 If there is no identification tags consider taking the animal to a veterinarian. Or shelter that has a microchip scanning device to check for a microchip. Also look for tattoos. An option is to turn the animal over to a shelter or humane society. His owner may be found or he may be placed for adoption. Contact shelters and humane societies and report the animal to them. They need the information on file in case the owners call there looking for their pet. If you wish to foster the animal tell them you wish to do so. Most agencies are agreeable to this. Place a "found pet" ad in your local paper. When placing the ad omit a pertinent piece of information about the pet. This will help you to be sure you find the owner. You may want to ask responders of the ad the name and phone number of their veterinarian. Call the vet and verify the information before turning the pet over to the caller. Local Newspaper Information - Check the "Lost Pet" ads daily. Ask people in the neighborhood if they know who owns the animal. Look for posters in the area that may be posted for the pet. You can place a found animal ad in the Winston-Salem Journal classifieds. Call (336) 727-7462 to speak to a Journal Representative. Craigslist – has a pet section where lost/found animals can be posted for free. wxii12 - has a pet finder section where lost or found pets can be emailed to the news station and posted on their page.